Since December 1993, Lifewater Kenya has been a registered Christian NGO run by Pastor David Maina, the Pastor of the Africa Inland Church, Parkview. It has grown from the 2 founding members, Pastor David and the head driller, Mr. Antony Makau to a staff of 28 members. David trained with the Ministry of Water Development as Water Supply Inspector and later on completed his higher diploma in Building and Civil Engineering. 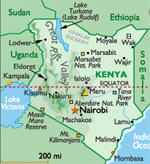 He resigned from the Government in 1987 and started the Ministry of Lifewater Kenya. Presently he is Pastor of the Africa Island Church, Parkview which is located in a slum area. He heads an active Community Development Program which also houses the Clinic for Mother Child Health (MCH); Home Based care for people living with HIV/Aids; voluntary Counselling and Testing (VCT) as well as a Kid's Outreach Ministry. 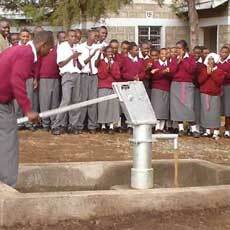 Antony started with Lifewater Kenya at its conception. 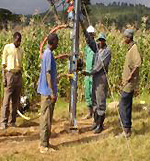 He remains the lead drilling technician who drills water wells with the LS 100 drilling rig.